Well, this was about the last car I expected to see parked outside a local burger joint on a Monday afternoon in December. I had first caught a glimpse of it half a block away, where I immediately noticed it was 1) old and 2) German. At this time, I didn’t know how old or which variety of German it was, but this was enough to pique my curiosity. It might be a BMW 2000CS, I surmised. That would be worth a stop. But as I got closer, I did a double take. It can’t be…an Audi? A 100 LS? But it was. Truth be told, I assumed that these had all rusted away decades ago, or been unceremoniously junked due to their notorious (in the US, at least) durability woes. It was on my official CC bucket list, but on the “I don’t actually expect to find one of these but I’ll keep looking anyway” category, rather than the somewhat-less-unobtanium variety. After hurriedly scurrying around the Audi, trying to get somewhat-decent pictures with my cellphone (the only camera I had with me) despite the massive pole blocking the profile view (sorry about that), I was on my way back to my own car when I was greeted by the Audi’s owner, who was sitting at a table outside. He didn’t seem too surprised that I was taking pictures, but he did offer some additional insight into this particular 100 LS. According to him, this is the oldest extant US-import Audi. Not the model, this exact car. It’s all-original, completely unrestored, with around 55,000 miles on the odometer. 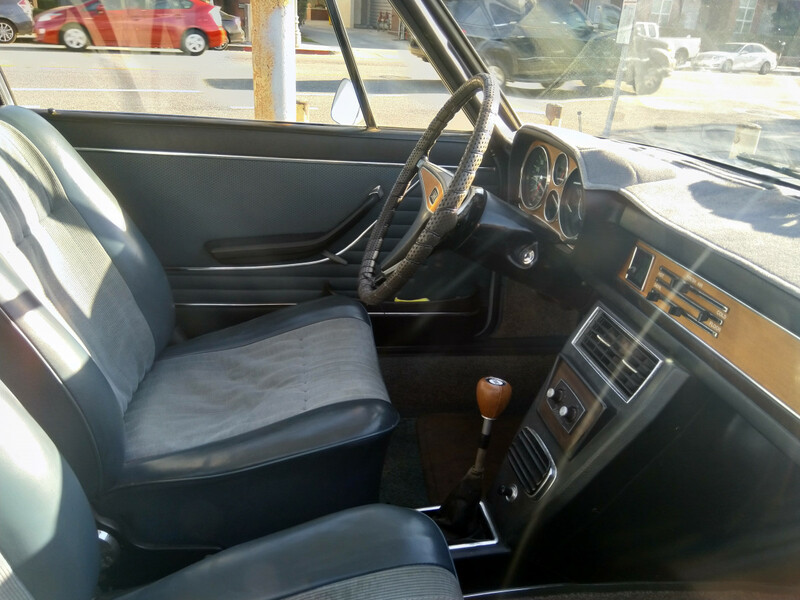 A cursory glance at the pictures will confirm what I saw with my own eyes: it’s in almost perfect condition, from the unblemished vinyl roof to the perfectly-straight chrome to the tufted corduroy seats. 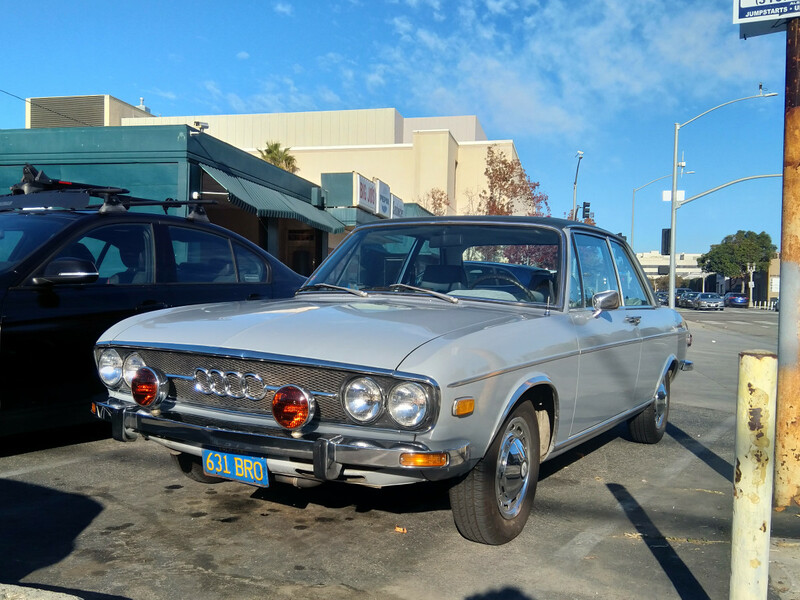 The owner was also clearly an Audi enthusiast (as if I couldn’t already from the car he drove), mentioning that he has acquaintances who possess an Audi Super 90, two DKW 3=6s, as well as a DKW Schnellaster. Clearly, I have more hunting around Southern California to do. Anyway, back to the car. The 100 LS has acquired a bit of a troublesome reputation here in the States. Any time an example surfaces on a car blog or for sale online, it is inevitably accompanied by a raging sea of anecdotal invective from past owners, who (it seems) usually bought theirs in 1979 for the princely sum of a Bee Gees record and a Big Mac and then got stranded on the George Washington Bridge at midnight during a snowstorm when the inboard front disc brake mounts collapsed and the ignition points fried and the HVAC gave out all at once and the rest of the car spontaneously combusted when they tried to push it home. 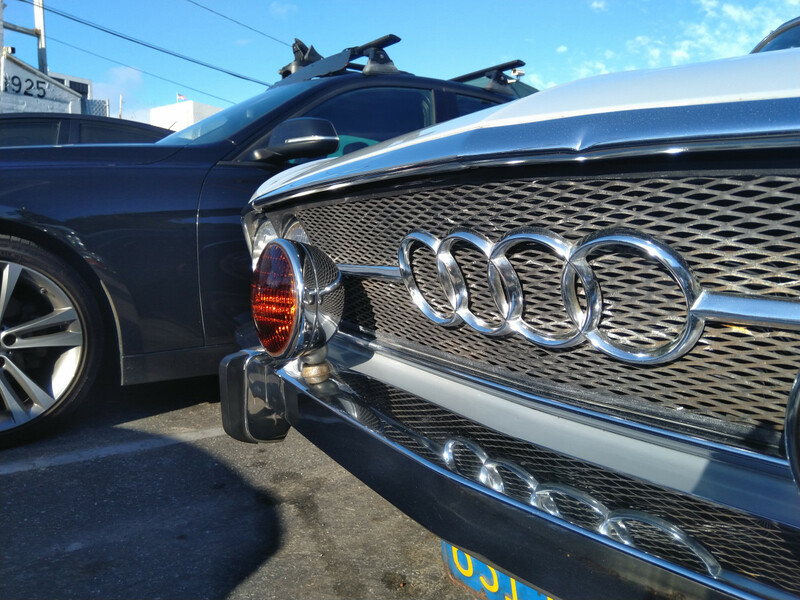 But when we step back and take a more worldly viewpoint, the C1 Audi 100 was a hugely influential automobile, both in its corporate design language and its establishment of Audi as a viable player in the near-luxury segment. 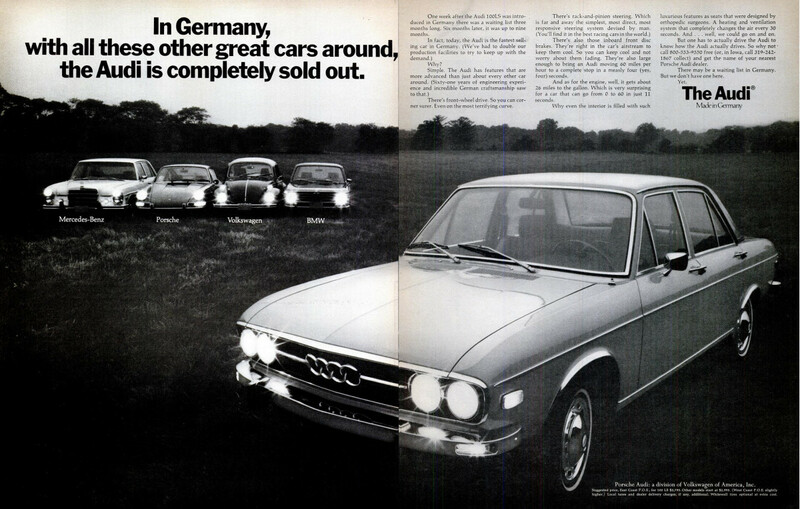 Over 825,000 100s were sold worldwide from 1968 to 1976, before which Audi was…well, barely a brand, and after which Audi was relatively well-recognized as a viable upscale offering and a stylistic innovator. But its development was never certain; in fact, it was done almost entirely in secret. First, a little history. The 100’s story begins with the acquisition of Auto Union GmbH (itself the parent company of DKW) by Daimler-Benz AG in 1958 after major shareholder Friedrich Flick (who also owned more than 35% of Daimler-Benz shares) was reluctant to finance Auto Union’s William Werner-designed prototype – which did, in fact, become the later DKW Junior (above) – without a concrete production timeline. He instead proposed a merger between the two companies, which was completed in full on December 31, 1959. Daimler-Benz then set out to modernize Auto Union’s automobile production, first building a new operating plant in Ingolstadt in 1959 (and subsequently acquiring Auto Union’s own Düsseldorf plant). In 1963, they appointed Ludwig Kraus as Auto Union’s Technical Director. Kraus brought with him plans for a Daimler-Benz-designed four-stroke “M118” engine (featuring a high 11.2:1 compression ratio and water cooling). But in the meantime, Auto Union was struggling. The company’s sales were falling fast, and profits were declining just as rapidly. 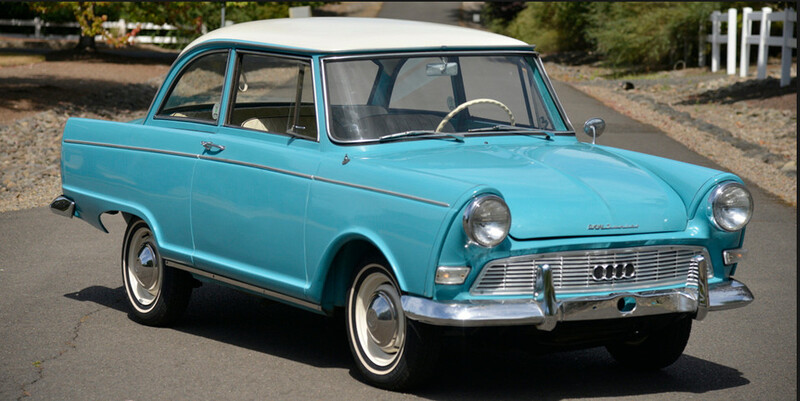 Consequently, Daimler-Benz sold off Auto Union to Volkswagen in 1964. That was also the year that Auto Union released the new F102, designed to replace the aging DKW 3=6 and Auto Union 100 (in background). It was a very modern looking sedan for the times, but under its hood the now-obsolete three-cylinder two stroke was still there. In 1964 the new BMW New Class cars were profoundly more appealing, along with others in the F102’s class. It was a failure. But the solution was now at hand. 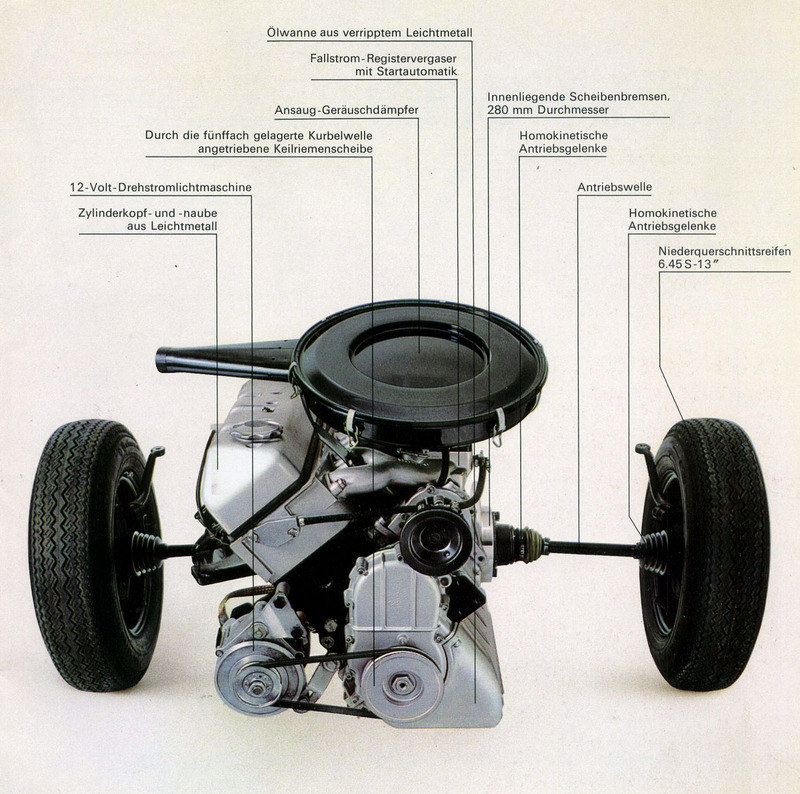 The new four stroke M118 engine premiered in the “Audi” (F103) of 1965 (later called the Audi 72), which was an F102 with an slightly elongated and restyled front end to accommodate the longer inline four. The Audi marque, which had previously merged with three other brands to create Auto Union in 1932, was resurrected to differentiate the new four-stroke model from the exclusively two-stroke (and very image-tarnished) DKW range. The new engine was far and away superior to DKW’s two-strokes, and the new Audi was a (relative) success: over 400,000 were built over the succeeding seven years. 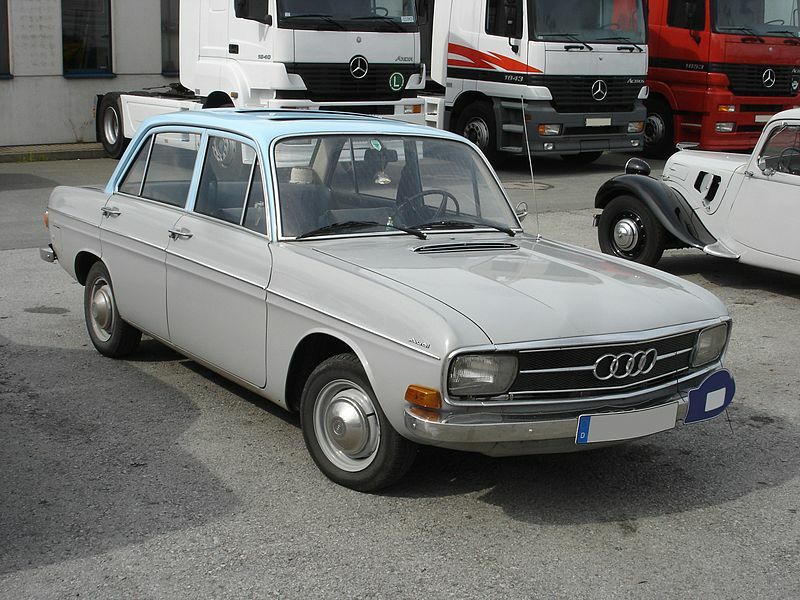 The Audi 72 eventually turned into the Audi 80 (the numbers correspond to power output in HP), which then became the Super 90 (sold briefly in the United States from 1970-72, with 5,487 finding buyers). This is a US-spec Super 90 with the requisite sealed beam round headlights. Finding one of these in the US would really be a trick. This is where Heinrich Nordhoff enters the story. 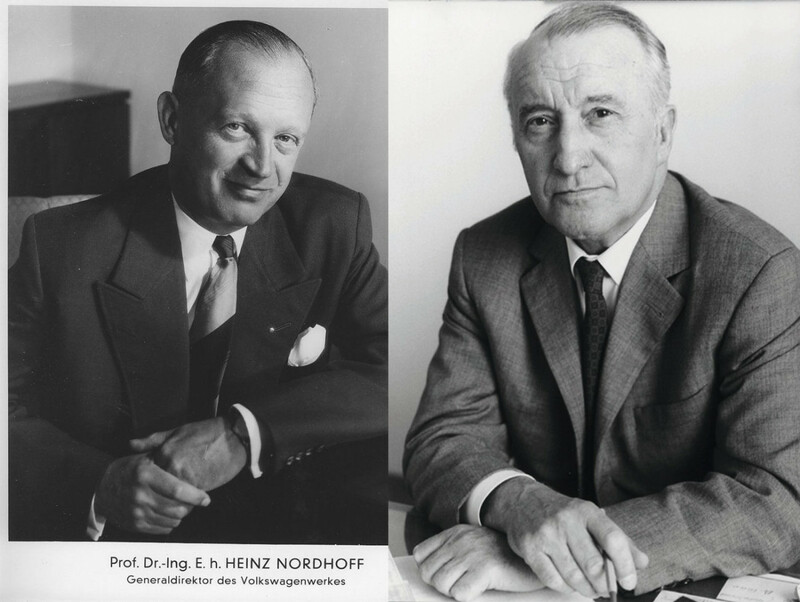 Nordhoff, the Chairman of the Volkswagen AG’s Board of Management, was intent on utilizing Auto Union’s Ingolstadt facility primarily for the production of Volkswagens, as the Wolfsburg plant was already operating at full capacity (a contemporary Der Spiegel article noted that 280 Audis were produced per day at the Ingolstadt plant, compared to 400 Volkswagens). Nordhoff therefore forbade any development at Ingolstadt, cutting staff and effectively stalling Kraus’s development of a new Audi model. But Kraus continued his work in secret, unbeknownst to the corporate bigwigs at Volkswagen. He and a small team of designers covertly put together plans for a new Audi sedan, to slot into the upper-midsize segment. For it was not just the four-stroke engine that Kraus had brought with him to Auto Union. During his time at Daimler-Benz, Kraus led the design team that produced Mercedes’ W118 prototype, which was intended to replace the DKW range at the bottom of Daimler-Benz’s lineup. When the W118 became the W119, the H118 engine accompanied it. The engine, as mentioned previously, was put into production in 1965, but the body was shelved by Volkswagen upon its acquisition of Auto Union. At least, it was shelved by the upper management. 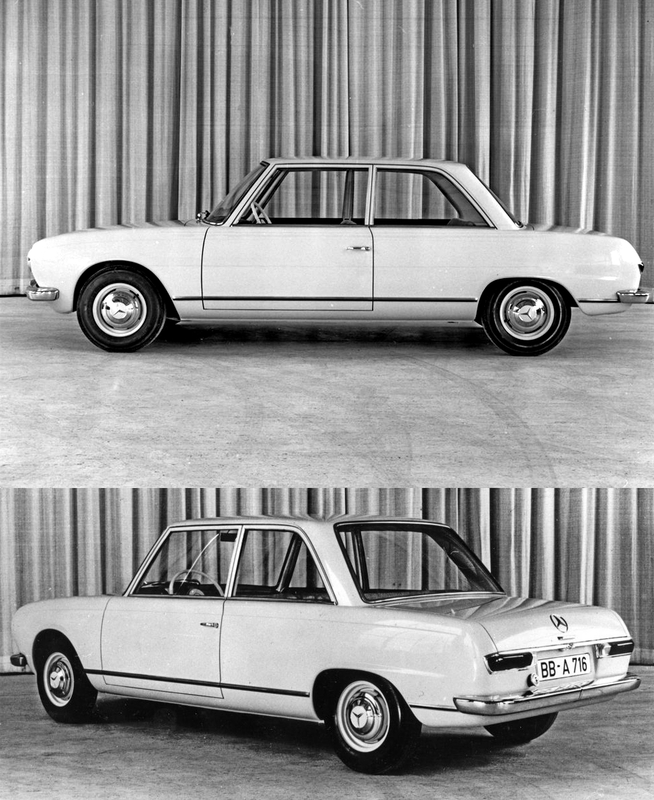 But Kraus’s Audi 100 design was clearly influenced by the W118/W119, as was the original Audi of 1965. Though the prototype also bears a strong resemblance to the W113 SL, its upright greenhouse and tapered rear carried over into the production Audi models. In 1967, Kraus and his team were still working behind a curtain – literally. The employees would stow the clay prototype behind a curtain in Ingolstadt, only revealing it after-hours when they would develop it further. The story goes that Rudolf Leiding, who was the Volkswagen board member overseeing Auto Union, caught a glimpse of the model one day when it was accidentally left uncovered. Leiding was impressed, so he arranged for the prickly Nordhoff to view the prototype under the guise of it being the results of a “body modifications” development order by the board. Nordhoff was suitably pleased, and gave the go-ahead to begin production. 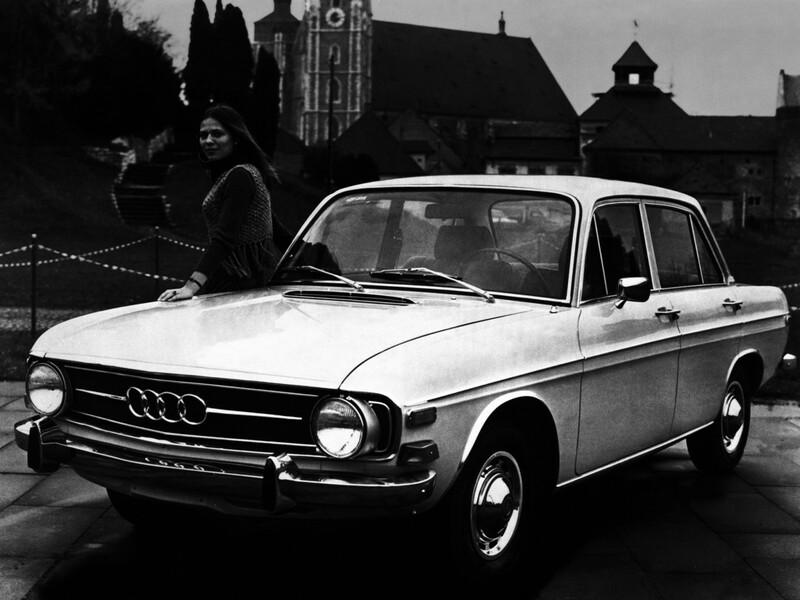 The car, now called the Audi 100, was revealed to the press in March 1968 and went on sale in the fall of the same year. Upon release, it was met with widespread praise from journalists. Its styling was hailed as being modern, clean, and airy, with more than one reviewer noting the “mini-Benz” look to the model; it was also very aerodynamic, with a drag coefficient of 0.369. Its fit and finish was on par with other German marques, and its 100-hp engine proved more than capable of powering the Audi up to speed: a 12.5 second 0-60 time was very competitive at the time. Contemporary reviews noted that it really shone with its ride and handling combination. Both a May 1970 review by Car and Driver and a May 1971 report by CAR Magazine commended the 100’s compliant, softly-sprung ride. Though both reviews noted the engine’s inherently dubious location (placed in front of the front-axle line, so that the weight distribution was close to 60-40) that seemed to be predisposed to understeer, CAR noted that the 100 cornered very neutrally, in a manner that belied its front-wheel-drive origins. (The front-wheel-drive layout, though novel for many American buyers, was not as revolutionary across the Atlantic: the 100’s lineage had been front-wheel-drive since the DKW F1 of 1932. It did, however, differ from many upscale competitors in this regard: one of the 100’s more progressive attributes.) 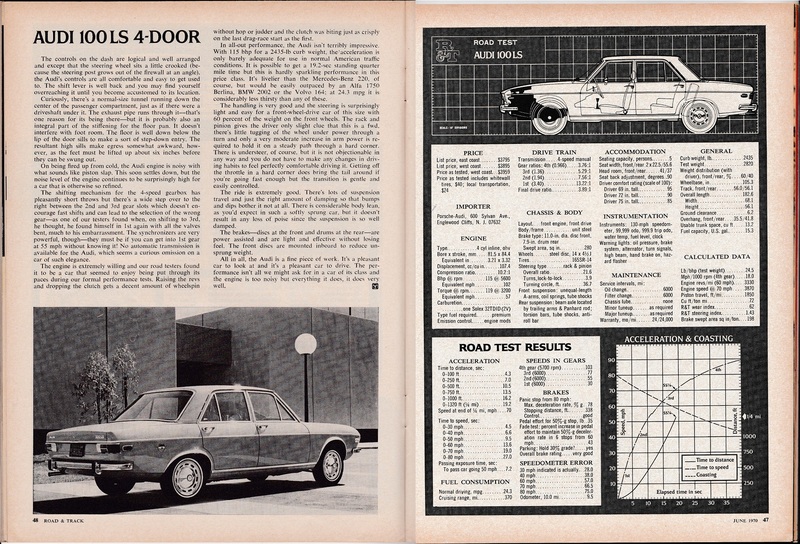 Popular Science concurred in an August 1970 test, describing its handling as “safe and predictable.” The 100 LS is also rumored to have been a particular favorite of Road & Track’s, but sadly, no easily-accessible copy of their review is available. But Car and Driver was not so enamored with the 100’s performance. Its testers experienced rampant understeer, claiming it was “almost impossible to get the rear end to come around,” even on tight turns. They also panned the engine’s performance in city driving, with noted unresponsiveness under 3200 rpm, and a peculiar lurching behavior upon throttle liftoff in the same rev range. The powerplant was also reported to be noisy, which may have been more of a function of Americans regarding a four-cylinder engine in this price range to be an affront to the large-engine-focused domestic market than an actual indictment of the mill itself. But nonetheless, it represented a burden-to-entry in the United States market. It was that price that C/D regarded as most criminal: though the Audi stickered at under $2600 US dollars ($17,335 adjusted) overseas, it was marked up to $3795 ($25,300 adjusted) upon entry to the United States. This made it around $500 dearer than competitive imports such as the Peugeot 504 and Volvo 144S, although a few hundred dollars cheaper than the BMW 2000 and around a thousand dollars cheaper than a Mercedes-Benz 220. It was a tricky segment to occupy in the United States, but Audi thought they had a shot, in large part due to their ability to share dealerships with Porsche (the 100 was marketed under “Porsche Audi: a division of Volkswagen of American, Inc.”) and ability to use Volkswagen’s established mechanic network. Executives projected 30,000 sales a year, which seemed to many an optimistic figure. But, lo and behold, the 100 LS crested the 30,000-per-year mark in 1973, and sold 146,583 in the United States over an eight-year production run from 1970-1977. While not exactly a runaway success, that number was competitive with BMW and Volvo (especially when coupled with production totals from the Audi Fox), and far ahead of import rivals from Peugeot and Saab. On the whole, it was a very productive venture for Audi. So why is the 100 regarded with such widespread disdain in the States? In one word: reliability. (Now, it should be noted here that many of these quality issues can be isolated to US-market cars for a variety of reasons. This piece is largely American-focused simply due to the author’s location of residence, and the rarity of finding a US-spec 100 LS in the wild. I’m told that the 100’s pernicious issues are not quite as widespread in its homeland.) The first culprit was the front brake design. The 100 LS came with inboard disc brakes, which was both touted by Audi in contemporary advertisements and allowed for the fitment of larger-than-average 11-inch rotors, as the rotor size was unencumbered by the wheel size due to its inboard location. On paper, this would seem to be an engineering triumph. In practice, this was not the case. The brakes’ location made them notoriously difficult to service, and contemporary reviews complained about their sponginess. It also appears as if their inboard location placed an undue amount of torque-related stress on them (though I am no engineer: that explanation may not be 100% correct), but the upshot is that they failed often, and when they did, they were exceptionally expensive to fix. The 100 also tended to had a particular penchant for munching CV joints. The air conditioning was another trouble spot. The compressor was mounted on the engine (complete with rubber bushings), ensuring a frequent need for replacement, and the radiator fan fuse apparently heated up quickly and deformed the fuse block, which led to more frequent failure and expensive fixes. These issues may not have been as problematic in the 100’s German home market, but A/C was a must-have feature in the United States, so its failure was a particular problem. 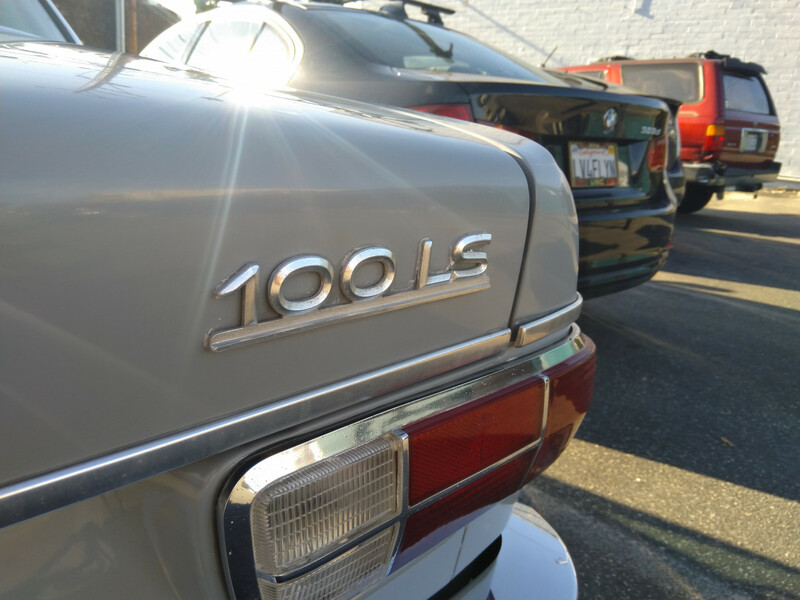 Overall, the 100 LS’s reliability record in the United States was abysmal. Consumer Reports reported a “much worse than average” rating from 1972-1976, noting particular trouble spots in engine mechanical, engine cooling, exhaust system, fuel system, ignition system, automatic transmission, air conditioning, brakes, and electrical system. So…basically everything. Those who reported selling and/or repairing 100 LSs when they were new are no less critical. More than one mentioned it as the worst car they ever sold/worked on, mentioning that the high temperatures under the hood vaporized any rubber or synthetic parts, and that the complex Solex carburetors had to be meticulously maintained. One former salesman called them “nice riding, well appointed pieces of crap,” and others mentioned that the 100 was colloquially known as “Hitler’s Revenge.” Ouch. It’s worth noting that many of these issues may have been caused by a few American-specific factors. One: the required smog equipment on US-spec 100 LS’s may have contributed to the unreliability under the hood. And many had air conditioning, which was still very uncommon in Germany at the time. Two: the excessive road salt foisted upon them by many locales in the northeast wreaked havoc upon both their bodywork and many other salt-vulnerable components. And three (this may be the biggest issue): the American mechanics were not well-equipped to handle the Audi’s foreign (to them) layout. Many past owners recall sloppily-performed repairs; one mentioned repeated “major safety-related nuts and bolts loose” after taking the car in for service. Another former parts manager said the mechanics never wanted to work on the cars, and the simple reality of it is that many of these technicians were unfamiliar with the Audis and used to working on the far-simpler Volkswagens. The two had very little in common; ergo, there were bound to be mistakes made. The expensive parts sourced from Germany couldn’t have helped, either. Some fifty years later, the 100 LS has all but disappeared from our shores. But it’s nice to know there’s still one trundling about the streets: a reminder of Audi’s humble beginnings, a genesis of its road to profitability, and a conduit to its triumphant future. The first time I saw one these was in the service entrance (how appropriate ) of the Pontiac dealer where my mother had purchased her 74 LeMans. I had no idea what they were and assumed that they were priced somewhere in the range of our car. Bzzzzt. Wrong. I thought they were beautifully styled, both then and now. I always appreciated the Germanc approach to car design of this era that combined elegance and practicality, all in a package that felt like a big precision instrument when you closed the door. It is a shame that the cars didn’t do well in our environment. And how cool is it to find the very first one brought here! 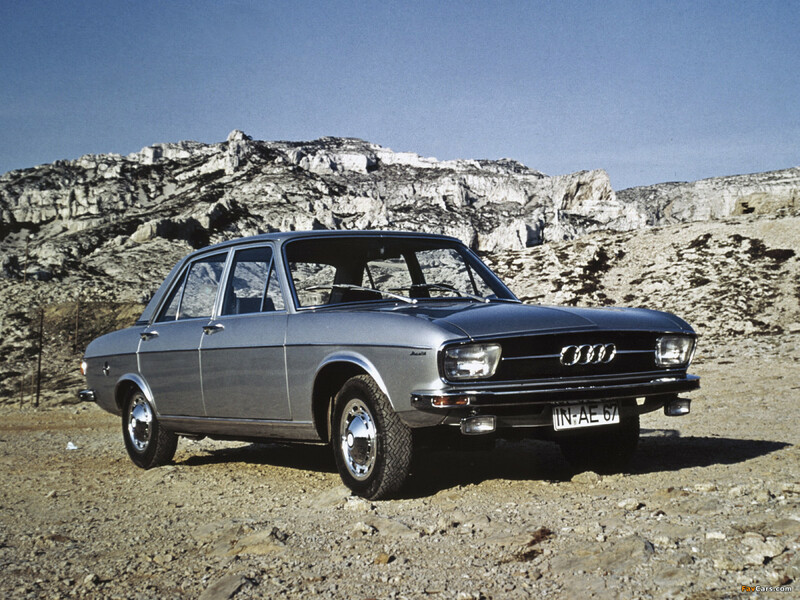 Denver in 1974 was my first exposure to the Audi 100. A new acquaintance had an orange coupe with black interior. It was a very nice car; I was impressed. He bought the car in Germany on a European delivery program and made frequent road trips to/from home in Colorado. I think he was pleased with the car as he subsequently bought other Audis. His was a handsome car; not just BMWs could be orange. There isn’t a false line on the four-door 100 (the two-door needs to be on a 5″ or so shorter wheelbase). Audi got off to a false start stylewise with the F102/F103 transition, dropping those great triangular turn signals on the fender tips in favor of tacked-on warts on the side and then doing the absolute bare minimum for the federalized model. Excellent sighting and article Professor. Like the Fox, an elegant, if conservatively styled design. When I initially became interested in car styling as a young child, the 100 LS was one of the first efforts that really helped pique my interest in European car design. 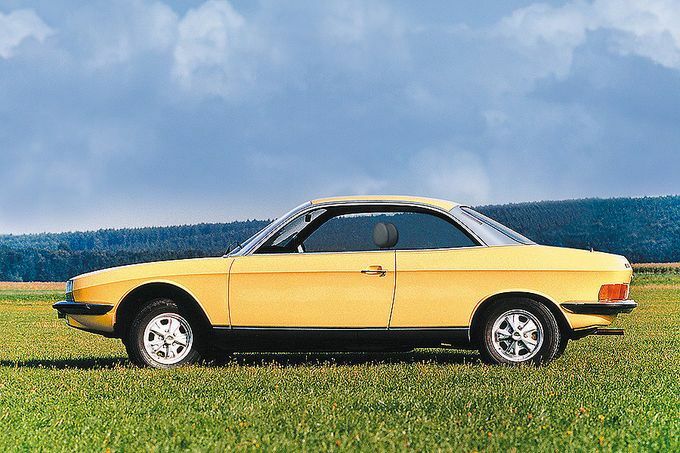 I’ve felt for some time Germany could have claimed the honour of one of the most beautifully designed coupes of the late 60s and early 70s if only a coupe version of the NSU Ro 80 had been introduced. Comparable to the 2nd gen Corvair in terms of cleanliness and beauty.The 100 LS looking bland by comparison. 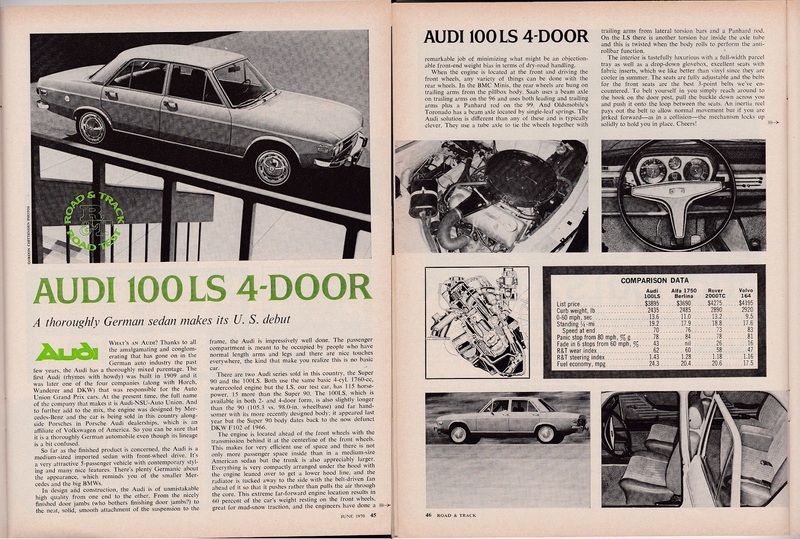 The true Audi 100 coupe was a fastback, the feature car in this article is a two-door sedan. I actually forgot about the genuine coupe. Partly because the very similar Renault R17 looked more attractive to me. Then and now. A NSU Ro80 2 door hardtop would have been something. But any Ro80 is a masterpiece. A wagon was designed. Not sure if one prototype was ever made though. Outstanding find and write-up! Several things jump out at me here — first is that I’d forgotten that the 2-dr. 100’s were sold in the US at all. Aside from that I’m astounded that nearly 150,000 of them were sold here at all… it seems that a decade later, they were virtually all gone, and I assumed they had been very low-volume cars. I also never knew corporate back-story here, so this was quite a revealing read. The rise of Audi in North America, for a peddler of the intriguing-but-flawed 100LS to the top-notch 5000 of the 1980s is fascinating. Hardly anyone could have guessed how the brand would soar (and then fall again, of course) by looking at this featured car. Very interesting review, thank you. R&T confess their staffer grabbed first gear instead of 4th, at 55 mph and bent all the valves. My guess is the engine over revved to 11,000 rpm, floating the valves sufficiently to hit the pistons, pretty much destroying the engine . They blamed the shiftgate design instead of an inattentive driver. Aha! I knew it had to exist somewhere. Thanks! Much as I expected: lots of praise for ride and handling, but the car definitely fell short on its “American-ness” (engine noise, highway performance, etc). Now I just have to find a Rover 2000TC to complete my collection of R&T’s 100 LS competitors. That would be quite a curbside sight in 2018. Also lacking in American-ness, stick shift only. I imagine that would hamper sales nowadays just a bit. It probably did back then too. Starting April 1970 a 3 speed automatic trans was optional. I’ll bet the engine remains were really too noisey after the shift into 1st at 55 MPH. Adding insult to injury blaming the shifter linkage after a likely overly aggressive driver blew up the testers engine! A co worker had a ’75 automatic 4 door in the early ’80’s, nice enough car, he had to gently turn corners with its loudly clanking worn out CV joints. This well cared for 2 door sedan is a great find, especially still being at least occasionally driven. In 1986 I worked for a Audi dealer (Merlin Olsen), there were a couple of Super 90 owners ordering parts, by this time there was a 4 page list of parts numbers that were still available for these cars. Mr. Olsen passed in 2010, never saw him without a smile on his face, talked to everybody at the dealership. He hosted a employee very nice Christmas dinner at the Starlight in Burbank, now long gone. Very generous person, enjoyed working for him. The dealership was sold in ’89 due to rising land values. My first example was my neighbor’s when I lived at 8th and Liberty in Erie, PA. And she was what became the stereotypical owner: about three years older than me (probably 25), attractive, very well off, daddy bought her the car for transportation to and from college (she seemed to be the eternal student, never had to hold a job). Very much liked her (never got anywhere, other than dropping acid together on a couple of occasions), but liked the car a lot more. Rode in it a few times, but never got a chance to drive it. And it definitely put my Vega GT to shame. Her daddy was a bit richer than mine, I guess. The 100 has been at near the top of my CC bucket list since starting this treasure hunt. You have really scored here, as well as with your superb write-up. That Mercedes W118 concept is a new one for me; fascinating. I was in Austria in the summer of 1969 when these were new there. It was a really big deal, as this was clearly a shot at MB and BMW. It was all over the covers of the car mags and general interest mags too. And got some first-hand Audi exposure that summer as my godfather had a lovely dark-green Audi Super 90 two-door. Things had changed rapidly since when we left 9 years earlier he was driving a tine Lloyd. 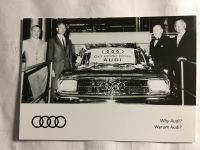 An Audi dealer opened in Towson right about 1970 in what had been the Mercedes dealership, a pretty modest place. The Mercedes dealer moved to nice new digs, as they were selling briskly in the upscale Towson area. I remember hanging out in there checking out the new 100 and a few S90s. When I first went to work at the little tv station in LA, I was initially out at the San Bernardino facility with a couple that had a brown 100LS two-door like this one they had bough used a year or so earlier. Lovely car, but they were having trouble keeping it fixed and running. I don’t know what the exact issues were. But before long a very plain and dull ’69 Dart two door sedan replaced it. Needless to say, it was a lot easier to keep on the road. Thanks for plugging a hole in our coverage. There aren’t many left! Beautiful looking cars, somewhat similar to the Fiats of the era, and like the Italian cars…let down by iffy mechanics (at least in the US). 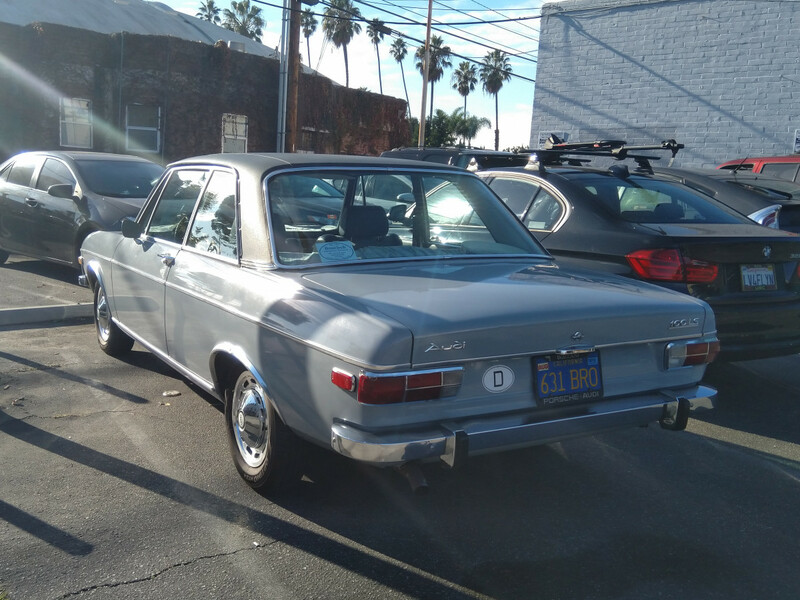 IF everything were the same in the early 70s I think I would have bought an Audi 100 over a 4 cylinder BMW, Volvo, or Peugeot. BTW, somewhat telling that this Audi is a very low mileage example, it really would be impossible to ever find a 100 with over 150,000 miles on it, even in a junkyard. Sykes – interesting! My first encounter was remarkably similar: a girl (friend) at college had one in 1974 that her daddy bought for her. She was a lot of fun, and a bit wild. She loved to take her car out on the twisty mountain roads around the school and go “jumping”. Yes, she got it airborne as often as possible, and had one jump that was a point of particular pride as she enjoyed using it to scare the living hell out of people. It involved turning the wheels while in mid-air to make the immediate curve just where the car landed. Ah, Beth “Boots”… I miss you wherever you are, not doubt with a drink in hand right now. Amazingly the car seemed to take it all in stride as far as I ever knew anyhow. Me? My folks had kindly bought me a Honda Civic …automatic. Sigh. The second example belonged to a newly married couple I knew around 1980. They’d just moved to the states, and his father got them a great deal on “a friend’s” Audi 100 with an automatic (Beth had had the stick in her car) in which said automatic transmission made it approximately 1,000 miles across the country, deep enough into the Midwest that the best thing to do was to sell it on the spot and buy a Chevy with the help of his embarrassed dad. Great article and excellent find! We had a total of four of them, all 4-doors, when I was a kid, two in Germany and then a ‘74 and a ‘71 in the US. Before that we had a Super90 as well as a DKW. The ones we had in the US did appear to be a bit more troublesome than the German ones but I do not recall my Dad having any “excessive” level of issues with them and no notable issues with the brakes (he did all his own repair/maintenance work. I never got a chance to drive any of them though, the last one went away maybe a year before I reached driving age in favor a Mazda 626 in ‘85.. That was the ‘71, so at 13-14 years old maybe it was all used up for my Dad. Four of them! You must be steeped in memories of them. Great find of an elusive automobile. In 1971 I was looking for a replacement for my tired VW Karman Ghia and test drove an Audi 100 at the VW dealer in Manhattan, KS. I loved the restrained but modern eligance with just the right amount of chrome. I also test drove the new VW-Porsche 914 and, as I recall, the two cars were priced fairly close. I ended up not buying either one but remember that both had a tight well made feel. I always liked the look of the Audi. It was a timeless design and still looks good today. The only way I’d buy an Audi today (or any other German car) is to lease it – they are too complicated and expensive to own after the warranty expires! I remember when Audi first showed up at the Detroit auto show. VW always had the best stand in those days. The other companies would have models in miniskirts flouncing around. VW had a couple guys in lab coats making a point about the engineering or construction of the cars. Audi followed VW’s lead, and the car, being so different from a VW, or other US market compact, gave them plenty of things to talk about. The front wheels of the 100LS on the stand were on turntables, with a light attached to one of them. A target with a photocell attached to a bell in the center, swung like a pendulum. A person from the audience would be invited to get in the car and try to hit the photocell in the swinging target with the light attached to the front wheel, the objective being to demonstrate the speed and accuracy of the rack and pinion steering. I watched a couple people hit that target successfully. Another bit was setting off a smoke bomb to show how the ventilation system worked. I came away from the show pretty impressed. Mentioned the Audi to a couple classmates and was told “cars must be driven by the rear wheels as nature intended”. Last time I saw an early Audi was about 81, and, in spite of the odds, it was a Super 90. Never knew they even sold a 2 door 100LS here. A two door never showed up in any brochure I ever saw. I’d be interested in knowing this history of this Audi and how it survived all these years. Did the owner give any background on the car? I don’t recall him saying anything specifically other than it being all-original and unrestored, although he may have (I may have just forgotten). In my excitement over the find, I forgot to ask further about this particular car’s history. Sorry about that! These were handsome cars back in the day. My younger brother had one of these in the ‘74-‘75 timeframe (I think it was a ‘72) in white with a cocoa brown interior and I remember being impressed with the quality of the materials used. His experience per my recollection was nothing major trouble-wise, just niggling issues that prompted him to move on. A truly well-written piece, Professor. The essence of what Curbside Classic is about. Hear, hear. You have done the find justice with a great article. 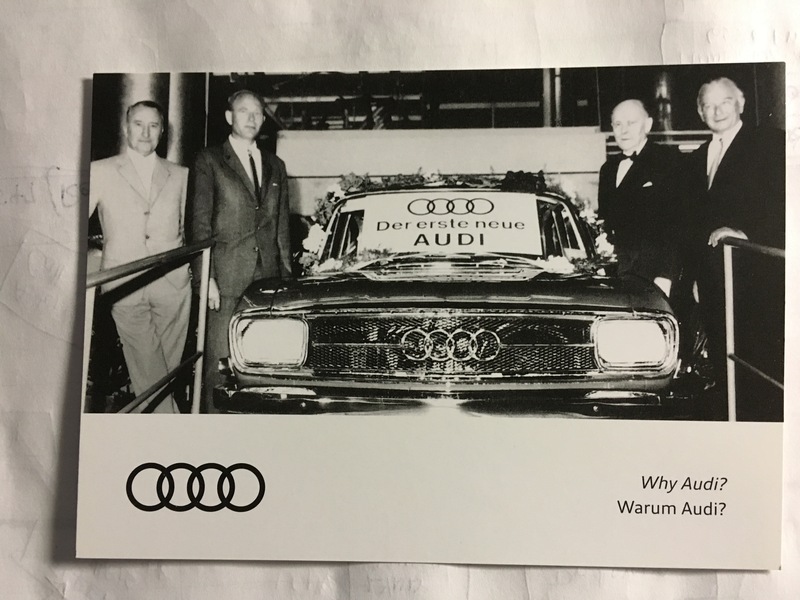 Attached is a picture introducing “the first new Audi” F103 of 1965. 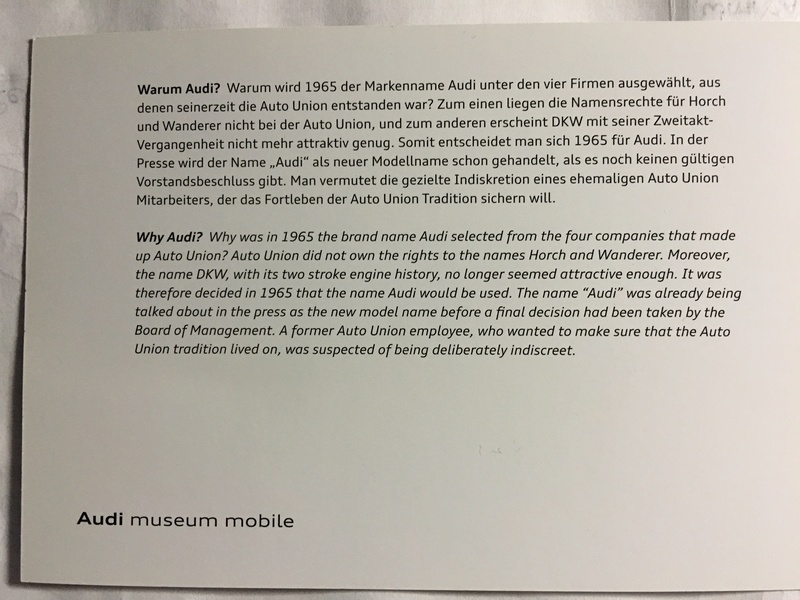 This is from one of many trading cards found at various locations in the Audi Ingolstadt museum during a visit this past spring. 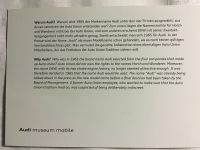 The back of the card gives a brief synopsis of why Audi was chosen over Horch, Wanderer, & DKW in the Auto Union fold. My best guess is that Ludwic Krass, Vehicle Development Director, is the gentlemen on the far left and Heinrich Nordhoff ,Chairman of the Volkswagen board is the second gentlemen from the left. Not sure of the others. That’s interesting, that the company no longer owned the rights to Horch, as the early US market sales literature talked up Horch. 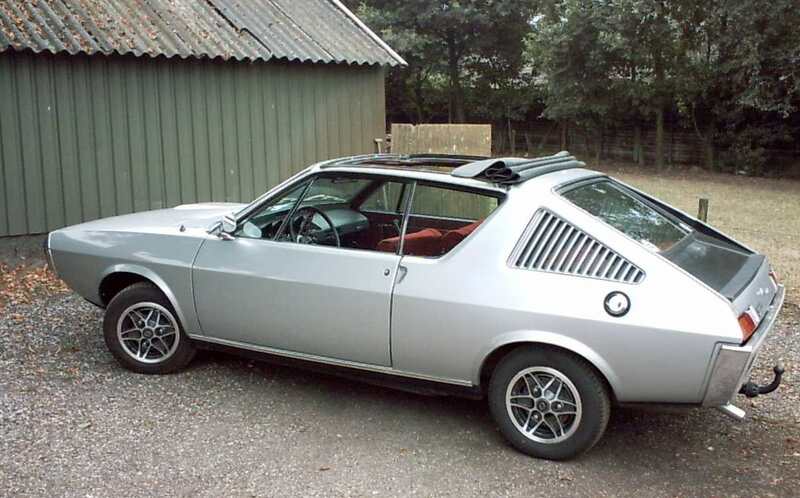 I have mentioned here before, that I figure the F103 should have been offered as a VW, then the Audi brand relaunched with the 100, rather than the money being sunk into the Type 4, and another pile of money being spent getting the NSU designed K70 into production. In addition to Mercedes cars, Studebaker dealers were selling DKW cars as well in the early 60s (though precious few of them). It is interesting to contemplate how that relationship would have worked out had Studebaker lived a little longer. Would the Auto Union products have gone away from US Stude dealers once Mercedes sold the company to VW? 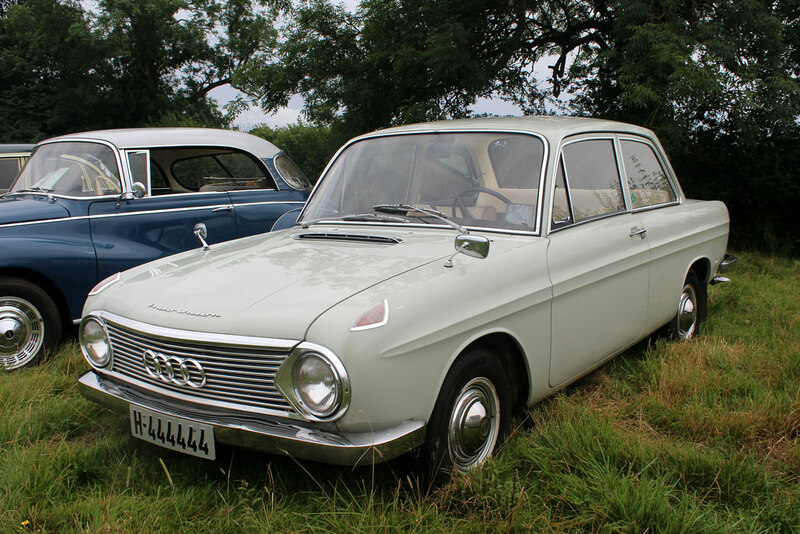 Or would state franchise laws have dictated that any dealer that had been authorized to sell DKW would have been entitled to an Audi franchise too. Not that any of this would have made much difference to anyone involved. 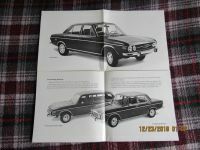 As it was, each of the three (Audi, Mercedes and Studebaker) each went a completly different direction by 1965. Excellent article, Professor. I thoroughly enjoyed reading it. This car is so pretty to me I am unable to judge it objectively on other aspects. It would be a lovely thing just to look at even if it wasn’t usable. Practically speaking, I guess it is an overpriced, complicated, unreliable car, at least in U.S. trim. Basically a death trap structure-wise. But those are left brain concerns. My right brain sees it as pure elegance and grace from the delicate A and B pillars to the roofline to the thin chrome trim. I can’t imagine any other wheels that would compliment the style of the car better, either. The coefficient of drag is amazing for 1970. You gave it a great and comprehensive write-up as well as complimentary pictures. I look forward to more site contributions from you in the future. Why do you think it is a death trap structure wise? I was just generalizing about the lack of crash protection compared to the newer cars with their beefy a-pillars and safety cages, etc. It would apply to all older, small cars not just the Audi. Wouldn’t surprise me if Audis back then we’re better than average in that respect anyway. In other words, sometimes I just say dumb s**t.
Not all smaller cars of that era, Volvo 144 and SAAB 99 as examples. Well I have first hand experience with this car. 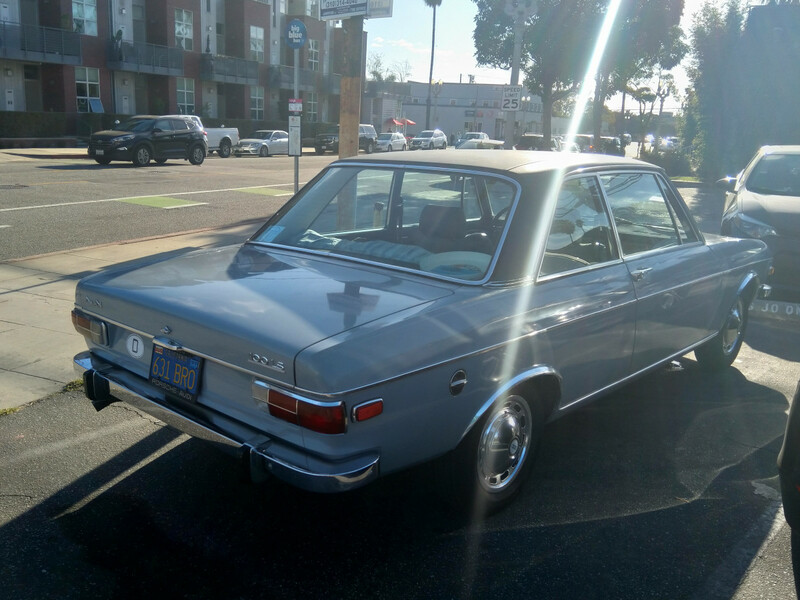 My mother got a 1974 Audi 100 LS very later in the model year after her abortive experience with a 1974 Pinto wagon automatic that lasted 16 months. The Audi was an automatic and it did have A/C. Now I wasn’t around the car much at all between then and September 1977 as my parents lived in the Bay Area and I was in San Diego. I do not recall any negative comments about the car from my mother. In fact I have no clue why that car was pick out of the blue which seemed so unusual. 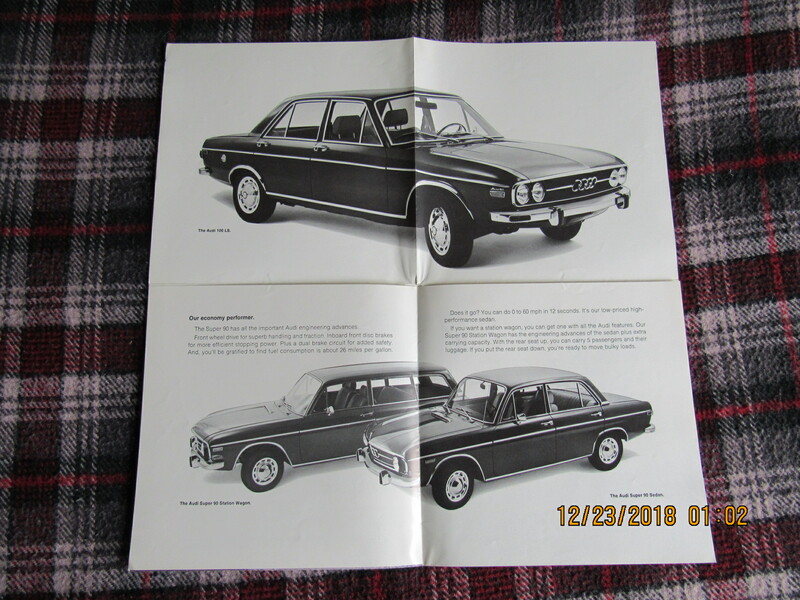 Maybe my father was into German since he had a 72 911E and 74 450SL and my mother had a 320i after the Audi. After that German cars were done and she moved to Mazda and then Honda for her last car. I do recall the car roomy. Rode nicely and handled well I thought especially when compared to contemporary American cars. Gas mileage was also better than them. Recall no major issues with the A/C at all. Do recall the stupidity of the inboard disc brakes when I first took the wheels off to change the pads and saw no rotors. Also recall the last major use of the car in September 1981 from the Bay Area to Southern California for the State licensing tests. Four of us drove down and back. Plenty of room except on the way back up US 5 the passenger front tire blew out and I wasn’t at the wheel. Steve did an amazing job keeping control and getting off the road to the shoulder. The jack was crap in the gravel and tow of us lifted the car after loosening the nuts. While up one swapped the tires and the other put the nuts on before our two friends lost strength. Just like in a pit stop. The only problem was flooded land behind us from the rain and mosquitos numbered in the millions. Between the four of us we had close to a 1000 total bites the next day when we saw each other at school. The car then disappeared and I believe it was electrical issues. Since I had a 1980 Civic wagon, being too small for the trip, being the reason I used the Audi. I still sort of fondly look upon the car but have never seen another since 1981. Interesting recollection, thank you. Inboard brakes are not exactly “stupidity” and have functional advantages over conventional brakes including less un-sprung weight and better control of brake-torque forces. It’s a nice engineering touch even if it did make brake service somewhat more complicated. I recall Audi made other efforts to reduce un-sprung weight, even when they went to outboard brakes, such as combining the swaybar and a control arm as a single unit on the 5000 models. What irritated me about the brakes is that it forced one to bring it into the dealer for basic work. I do not like a car, or a manufacturer, that designs a car where I must take it in for something as basic as changing pads. Being capable it is one of my most basic peeves. Keep in mind that in Germany/Europe, DIY car repair was essentially unheard of, especially with a relatively expensive car like an Audi. They obviously weren’t thinking about American DIYers when they designed it. 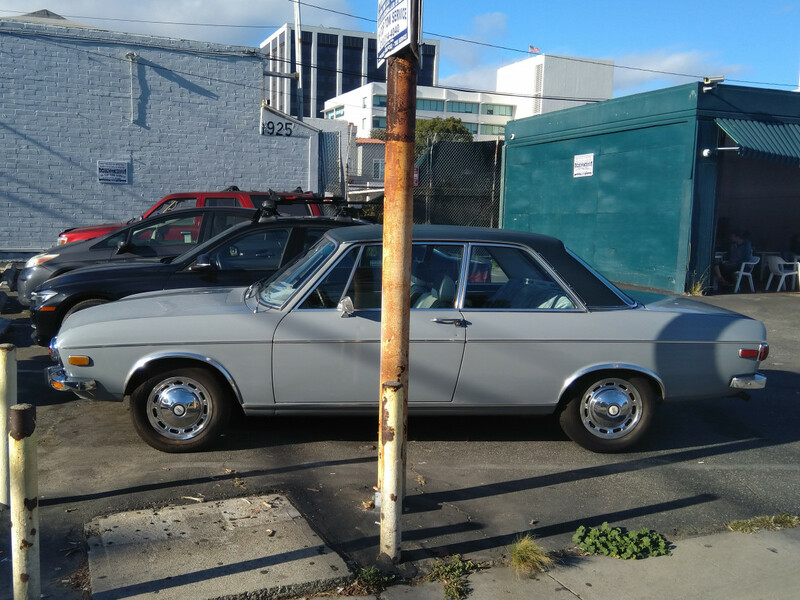 I grew up in L.A. My dad had this 1970 100LS as a 4 door also in “Chinchilla Grey” and same interior (plate 503DMB) may have also come from Bozzani as this one advertises, they were our closest dealer but my dad would shop around and ours was without any plate holder. This brings back memories. He got rid of it when he could no longer purchase leaded premium whenever that went away. We also had a 76 100LS and an 84 5000s. He loved those Audi’s. One of my all time favourite cars. It seems only the Germans can design cars with elegantly retrained lines that still look good years later. The influence on the first generation Passat inside and out was obvious. Our family had a blue LS 4 door automatic for 3 months whilst we drove through Europe in 1977. I was 10 at the time but clearly remember it as being very pleasant to ride in and it didn’t miss a beat. I don’t know what the reliability record was like for this model back in Australia. Like anywhere else I haven’t seen one on the roads here in years, but they weren’t the cheapest cars when new so they were never plentiful plentiful. Only the 100LS and the 100GL (sadly all automatics) 4 door sedans sold here, so no 2 doors or the tasty coupe. I’ve seen one private import coupe here. Interestingly. Wikipedia stat’s that US spec models were fitted with fuel injection at some point. These were nicely styled and finished, a pecurser to what later Jettas would be. I recall my folks driving into the local VW dealer circa 1977 when I was 13 to look at these, but being diehard Ford fans, they of course didn’t buy one. By this time, here in Canada, these cars had the reputation of being very “sickly” and needing lots of repairs, even when new. Always wanted one since they first came out. Bought a a new Volvo 142 instead. Only real issue with the Volvo after 10 years and 100,000 miles was the felt type crank seal that leaked oil and burned up the clutch. Still have the pins that I made up from cap screws in order to get things back together. Later that year, the Volvo got totaled in Chicago traffic. Still miss it with the similar gray color. Both attractive. The Audi even more so – would have made a better chic magnet. Fantastic article. I had forgotten about Audi’s abysmal start in the U.S. market. Such an attractive car. I owned a Red 100LS back in 1990. Bought it from the original owner, a UW librarian. It did handle and ride like a champ. Sold it to a friend for what I paid. Unfortunately the transmission imploded not long after he bought it. Was it an automatic transmission? They all failed! 1. The automatic transmission fluid would leak into the differential. 2. The transmission cooler would fail allowing engine coolant into the transmission and automatic transmission fluid into the cooling system. Old school German mechanics recommended a rebuild between 60,000 and 90,000 miles. Even with these problems they kept making the same automatic transmission design from 1972 until 1993. I can remember seeing these cars around my part of NE Ohio, but I haven’t seen one in 35 years or so. This was a great find. It’s something to see how far the marque has progress since then. Great article on the origins of Audi, of which I was unaware. I remember the 100 plying the roads of western New York as a kid. Always thought Audi made made an exceptionally handsome car, more so than any other German make. I had heard they were problematic and required a specialized mechanic, but as a kid that’s all I heard about foreign cars. I never took too huge an interest in mechanicals (I’m amazed at the knowledge of such here at CC); I was always more interested in styling and how cars were marketed, Audi was always a very desirable car in my mind’s eye. Unfortunately there were no dealerships within bike-riding distance when I was a kid, so my knowledge of Audi is limited. Yet considering the reported failings of the Audi, coupled with the huge, and I mean huge, PR nightmare of the 5000 model, I’m surprised Audi even survived the 1980s. Audi doesn’t register much with me anymore, maybe because of the unfortunate grille of 10-15 years ago (VW tried it very briefly), or perhaps their image has shifted with me, I don’t know. I’ve driven a few late model trade-ins at the dealership, and they drive like silk; however I drove a high mileage A4 one night 350 miles back from Pensacola, and it was nothing to brag about.. I just know it’s highly unlikely I would ever entertain the thought of owning an Audi, anymore. 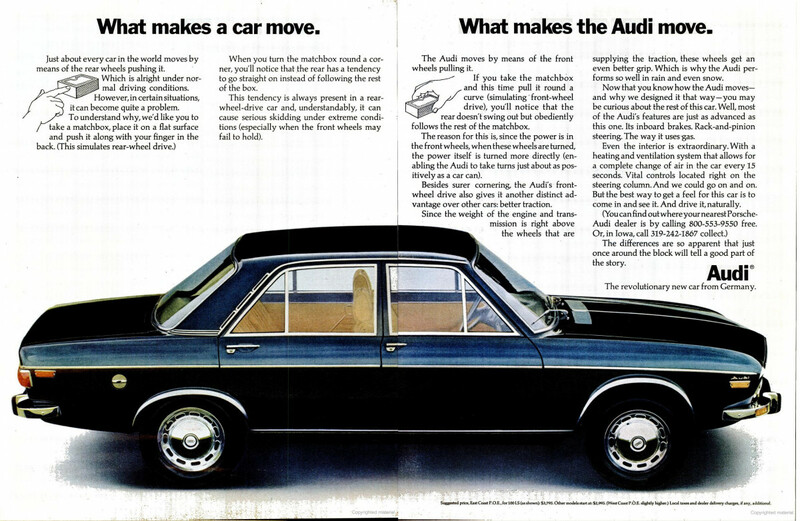 I really liked the 70’s and 80’s Audi’s and had my share of owning many versions, especially Audi 5000’s (100 & 200’s). Unfortunately even with all the “Dr Engineers” designing these cars in Germany they were a never ending story of things that fail that did not fail on other car brands Then you would think that the early models with a history of failing components would be quickly improved in each model year. But no, they kept shipping the same problems to their customers year after year. Cool cars for sure, but cool junk. A friend of mine in Los Angeles in the late ‘70s had a Super 90 station wagon. At the time he and his wife got it they were looking for something like a Saab 95, but more refined. He was impressed by the fact that it had two hood latches, not just one. This statement stuck with me and was a small factor in my getting an Audi 4000 quattro some years later. He said it was well made, but when he needed a new carburetor float, the price made him wonder if it was hand-carved by Ferry Porsche. I moved to Seattle in ’81, and when they visited me a few years later, they were driving a Camry. IIRC the Super 90 had the same engine as the 100, but with slightly lower compression. In commenting on the engine’s noise level, Consumer Reports said the Audi engineers had clearly tried to extract every last bit of power from the engine. While hitchhiking around Boulder, Colorado, ca. 1973, I got a brief ride in a 100LS, and it seemed pleasant enough from the passenger seat.